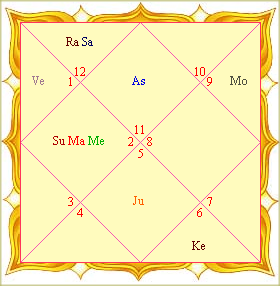 Rahu and Ketu are exalted in Taurus/Scorpio and debilitated in Scorpio/Taurus respectively. They are also exalted in Gemini and Virgo. Besides Rāshi (D-1), Navamsha (D-9), Dreshkana (D-3), Dasamsa (D-10) and Trimsamsa (D-30) are considered significant divisional charts. ^ David Pingree, 1963, "The Indian Iconography of the Decans and Horas", Jouranal of the Warburg and Courtauld Institutes, 26(3/4): 225. ^ Sutton, Komilla (1999). The Essentials of Vedic Astrology, The Wessex Astrologer Ltd, England, p.21. ^ Sutton, Komilla (1999). The Essentials of Vedic Astrology, The Wessex Astrologer Ltd, England, pp.61-64. ^ Charak, Dr. K.S. (1996). Essentials of Medical Astrology, Uma Publications, pp.5-6. David Pingree, "Astronomy and Astrology in India and Iran", Isis - Journal of The (1963), 229-246. David Pingree, Jyotiḥśāstra in J. Gonda (ed.) A History of Indian Literature, Vol VI, Fasc 4, Otto Harrassowitz, Wiesbaden (1981). Ebenezer Burgess, "On the Origin of the Lunar Division of the Zodiac represented in the Nakshatra System of the Hindus", Journal of the American Oriental Society (1866). , "On the Views of Biot and Weber Respecting the Relations of the Hindu and Chinese Systems of Asterisms"", Journal of the American Oriental Society (1866). Satish Chandra, "Religion and State in India and Search for Rationality", Social Scientist (2002). James Braha, Ancient Hindu Astrology for the Modern Western Astrologer, 1986, Hermetican Press, N. Miami, FL, USA. Hart de Fouw and , Light on Life: An Introduction to the Astrology of India. 1996, Lotus Press, Twin Lakes, Wisconsin, ISBN 0-940985-69-1 . V.K. Choudhry, Systems´ Approach for Interpreting Horoscopes, Fourth Revised Edition, 2006, Sagar Publications, New Delhi, India, ISBN 81-7082-017-0. Komilla Sutton,The Essentials of Vedic Astrology, The Wessex Astrologer Ltd, Bournemouth, England, 1999. Richard Houck, Hindu Astrology Lessons, 1997, Groundswell Press, Gaithersburg, MD, USA. Prash Trivedi, 27 Celestial Portals, Lotus Press, Twin Lakes, Wisconsin, ISBN 0-940985-84-5 . David Harness, Nakshatras: The Lunar Mansions of Vedic Astrology, Lotus Press, Twin Lakes, Wisconsin, ISBN 0-914955-83-7 . Sanjay Rath, Introduction to Vedic Astrology. Prash Trivedi, Key of Life: Astrology of the Lunar Nodes, Lotus Press, Twin Lakes, Wisconsin, ISBN 0-940985-33-0 . C.L. Diwan, Discovery of Astrology,1994, Amar Jyoti Press, Jhansi, UP, India. "Hindu Electional Astrology", [A compendium on Vedic system of electional astrology by V K Shridhar] ISBN 81-901413-0-9 .